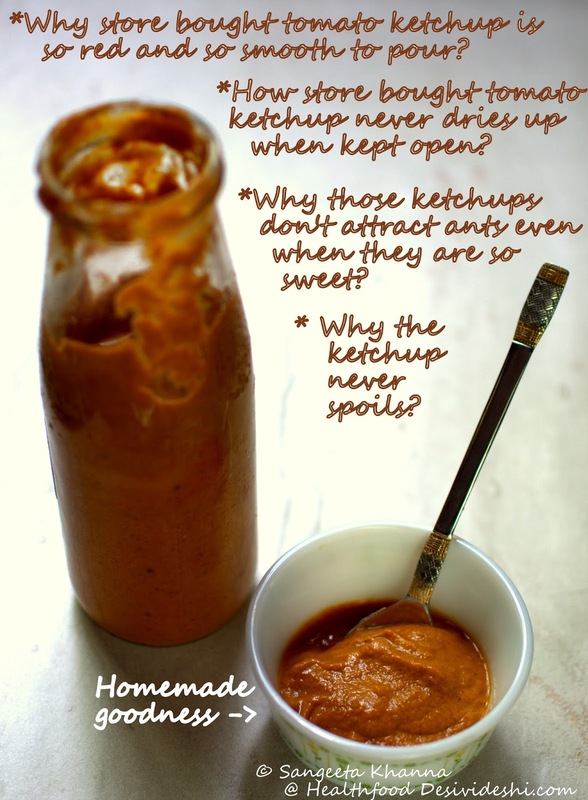 Do you eat tomato ketchup with every meal? Please say NO. And please ask questions about tomato ketchup. But you know why I am asking. My heart sinks when I see huge sack like 1 kilo packs of tomato ketchup with a plastic pout on the supermarket shelves. There used to be small glass bottles of tomato ketchup when we were growing up, though we used to call it 'sauce'. And this 'sauce bottle' was taken out when there was some samosa or pakoda being fried and there was no Imli sonth ki chutney on the table. The samosas and pakodas were always served with a green chutney and a Imli sonth ki chutney, the 'sauce' came to the rescue when we ran out of Imli sonth ki chutney. Those were the days when the little dot of 'sauce' on the plate was more of a garnish and was often left untouched. Leaving the tomato ketchup untouched was helpful once in finding out a startling fact about commercial tomato ketchup. Last year we visited Mysore and were staying at CFTRI (a CSIR unit) guest house. Arvind was on a work tour and I used to wander around town the whole day to come back in the evening and have tea with him. The guest house staff would bring some snacks with tea always and one of those days it was some pakoda with 'ketchup'. We finished chai and pakoda and the ketchup bowl kept lying on the work table in the room where I had kept some fresh fruits too. I noticed the ants kept attacking the fruits and left the ketchup untouched. See the picture I shared on my fb page back then.This piqued my interest and I told the room service guy to leave the ketchup bowl there. it kept lying there for 4 days and no ants came near it, nor the ketchup dried up. What was it made of? Not only the ketchup is made of more synthetic ingredients than real, it has way more sugar that we perceive and eat it with all savoury foods. It causes us to eat more sugar unknowingly and also makes us eat more salt in the savoury stuff to balance out the sweetness of the ketchup. Unseen culprits these. We need to know more about why the consumption of ketchup in each family has increased manifolds. Sometime in last 2 decades the glass bottle of ketchup started growing in size and I saw ketchup bottles that the kids couldn't handle any more. It got worse in the last few years when a large plastic pouch that looks like a sack replaced the glass bottles and people started pouring ketchup onto their plates with every single meal. Yes, unfortunately I know a few people who have it with every meal. I was horrified when my dad asked for ketchup with his paratha breakfast when he visited me few weeks back. He was never the one who ate ketchup but somehow he also got the bug. HOW? We all know the truth. Processed food is designed to be addictive and the addiction grows. With so much sugar per serving one gets used to the sugar rush with every meal and the MSG makes everything tastier of course. Along with these we end up eating a few preservatives, emulsifiers and artificial colours too. Wouldn't we like to stop it? I got alarmed after my dad asked for ketchup honestly speaking. He is a diabetic and still thinks it is okay to have a bit of ketchup on the side. Many kids pour about 1/4 cup of ketchup with paratha or even bread, they eat everything with ketchup. Someone asked me how do you eat omelettes without ketchup? Well, I never knew you needed ketchup for omelettes. I only knew potato fries were dipped in ketchup just like churros were dipped in a chocolate sauce. Both were rare foods for me. Still are. Closer home it was the tip of samosa that was trickled with ketchup, the TV adverts showed us. Later the TV adverts squirted ketchup on paratha too unfortunately. Could we choose any better? My parents used to make their own ketchup long back but we stopped eating ketchup, most probably got bored of it. I wouldn't have posted any ketchup recipe because we simply don't eat ketchup. Recently I was experimenting with some natural sauces and dips I was developing for a new snacks brand and just thought of mixing a few leftovers to make a ketchup of sorts. And the quick method worked wonderfully. This ketchup needs refrigeration and stays well for 2-3 weeks easily. It can be made as sweet as the store bought ketchup but I recommend you lower the amount of honey each time you make it, just to make sure you don't end up eating too much sugar in a day. This ketchup recipe would not make you strain tomatoes or reduce them over gas flame for hours. Just make small amounts enough for 2 weeks in about 10 minutes work and make way for healthier eating. Do not go by the looks, the taste is pretty close to the bottled tomato ketchup and you have the flexibility to adjust the taste as well. 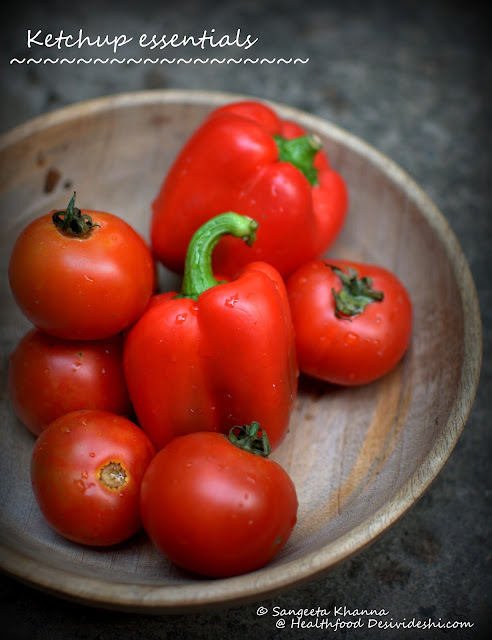 Chop the tomatoes, bell pepper and carrot in small bits and pressure cook with salt. Do not add water as tomatoes have enough water. Cool down the mix. Now transfer the boiled vegetables mix to a blender and add all the other ingredients and blend till an emulsified smooth ketchup is ready. Fill in a clean glass bottle or squeezy bottle and refrigerate. Use as required. If you want a more vibrant colour in your 'sauce', make this sweet chilly-ginger-tamarind sauce and see how it feels so close to the tomato ketchup you are used to. These sauces could be useful in making meals quicker sometimes, use them to make curries in a jiffy. 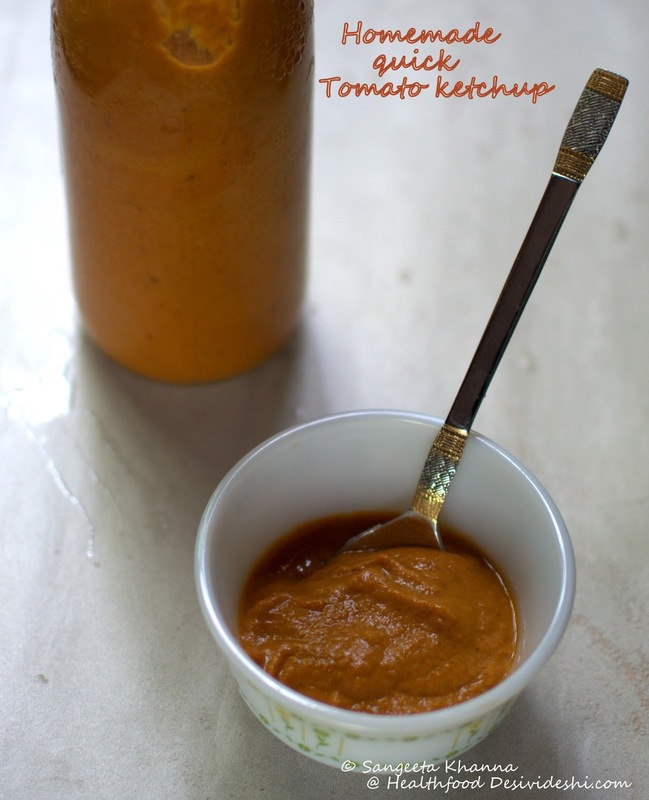 This homemade ketchup makes great butter chicken when converted into a gravy base. Try that. Check out the ongoing lunch box series and give me your suggestions about making lunch boxes practical and enter a chance to win a few cute useful things for yourself. quick recipe of tomato ketchup | why packaged tomato ketchup never spoils and how it is so red? I remember mom making ketchup at home. Somehow we as a family never got very used to the whole ketchup addiction. Even now I have a small bottle around in case a ketchup addict visits and asks for it. This recipe I love. It would be a great dip to give my rather notorious and choosy 2 year old who turns up his nose the second things don't taste good. So good to know someone else who didn't get addicted to ketchup :-) thank you Rituparna. Glad this homemade instant tomato ketchup recipe is useful for you Natasha. Thanks for letting me know. Recently i read one of your posts on facebook which made me search about this article. Thats such a great observation and solution. Thanks. I just shared it within my family. At times i wonder how my lifestyle has changed and we dont take our health seriously. I need to visit your blog frequently, to do some good for myself.